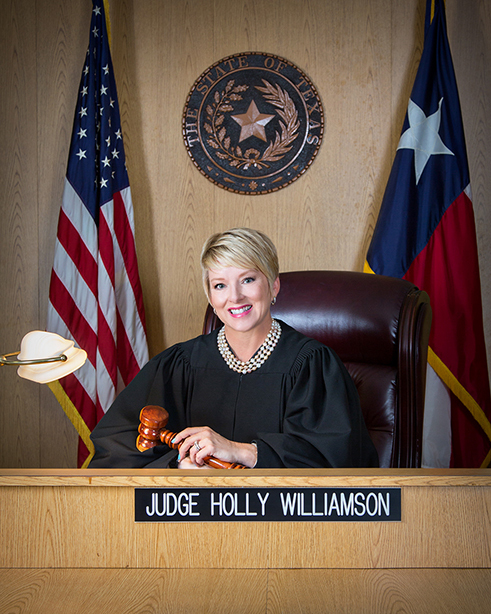 Judge Holly Williamson was sworn in as Presiding Judge of Harris County Justice of the Peace Court (Precinct 8-1) on January 1, 2009. She also served as Co-Presiding and Presiding Judge for the sixteen Harris County Justice of the Peace courts from 2010 - 2015. One daughter graduate of Texas A & M University. awarded by The Bridge Over Troubled Waters, Inc., (The Bridge) a comprehensive crisis center assisting survivors of domestic and/or sexual violence and those who are homeless due to these circumstances or another crisis.